Socka Mexico 9096. 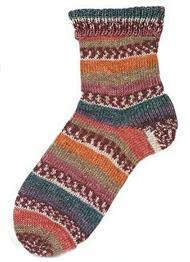 A self-patterning 4 ply sock knitting yarn featuring bands of fair isle and colour. Machine washable blend of 75% wool, 25% nylon. 100g ball / 420m.